Ladies and Gentlemen, step right up and play Carnival Royale slot machine. With this online slot, you could win real money while enjoying the sights and sounds of a circus. Who will really be the star of the show? The ringmaster? The fortune teller? The strong man? … Or could it be you? Take a spin of the Carnival Royale Slot machine and find out if you will come on top. 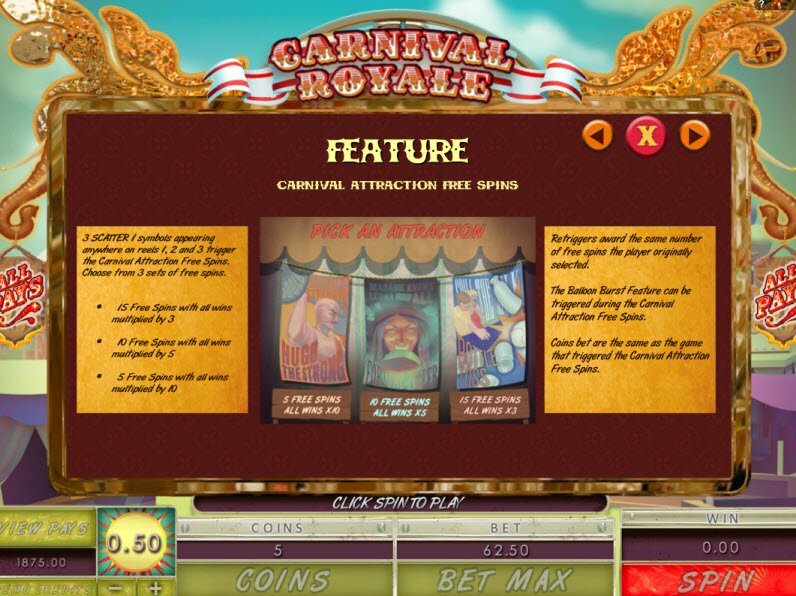 Walk through the entrance of the tent and marvel at Carvinal Royale’s exciting circus-inspired slot machine. Instead of three rings, the Carnival Royale features 5 reels with an astounding 243 paylines. Be amazed by the wild cards, multipliers, free spins, and not one, but two scatter symbols. The fun-filled atmosphere will surely have you coming back for more. Powered by Microgaming Quickfire, this circus-themed online slot includes well-designed gaming graphics. The reels light up and sounds of the circus accompany the game. You’ll see the entertaining ringmaster, fortune teller, strong man, clown, and circus monkeys. But you could really be the star of the show with a chance to cash in major payouts. 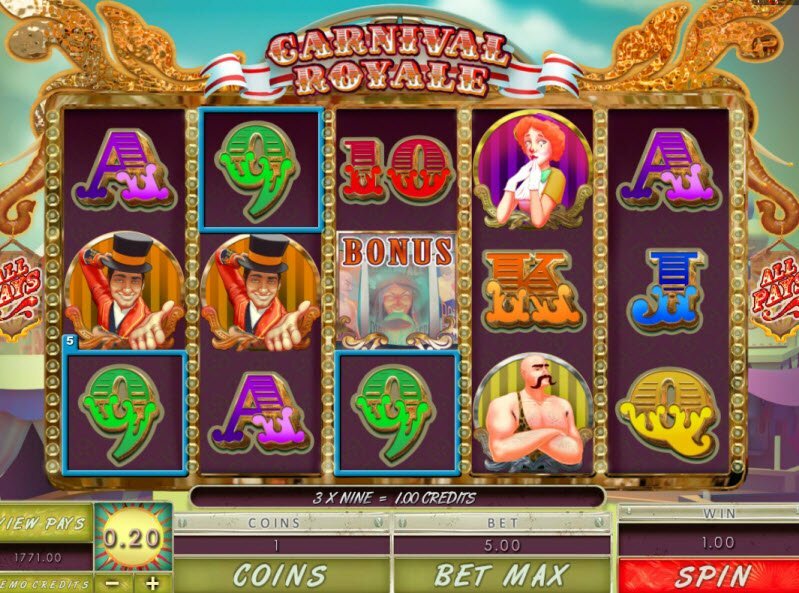 The Carnival Royale Slot features not one, but two scatter symbols. The first scatter triggers the Carnival Attraction Free Spins… Scatter 2 triggers the Balloon Burst Feature, which can activate during the Carnival Attraction Free Spins. 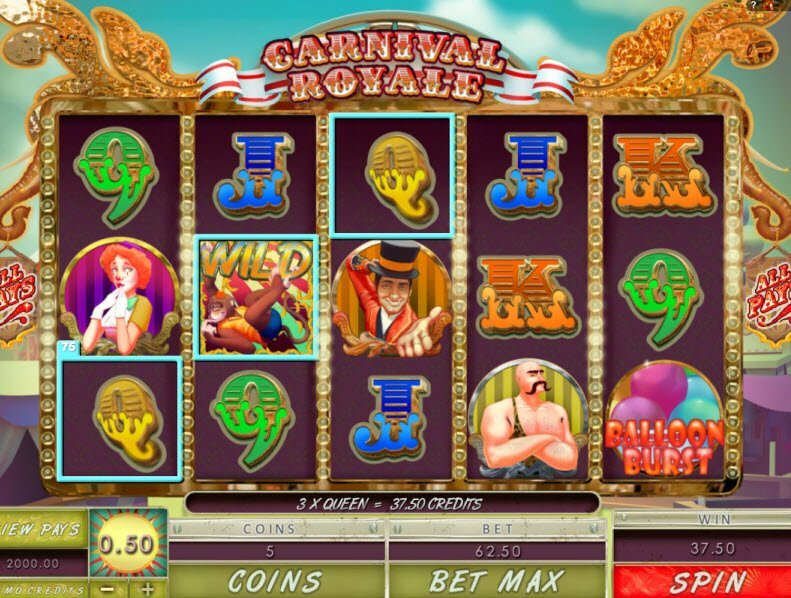 The Carnival Royale Slot Machine will keep you entertained with its many bonus features including wild cards, multipliers, and free spins along with multiple scatters and bonus games. For example. the Wild Symbol consists of a circus monkey and, in the typical fashion, substitutes for all symbols, except scatters. Scatter 2 triggers the Balloon Burst Feature, which can activate during the Carnival Attraction Free Spins. During this feature, the player selects balloons to pop. Each balloon reveals either Coins or a “Collect”. If the chosen balloon reveals Coins, the player can pick again. If the selected balloon reveals a “Collect”, the player will win the accumulated prize. The game also offers fun facts relevant to the game theme such as: Did you know that the majority of contortionists are either frontbenders or backbenders, depending on which direction their spine in more flexible.